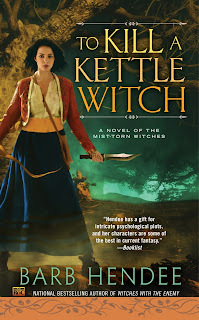 About 24 hours to the release of TO KILL A KETTLE WITCH, available in ebook and massmarket paperback. The fourth episode in The Mist-Torn Witches series by Barb Hendee. Set in the same world as (but separate in story/characters from) The Noble Dead Saga and the coming first book of The Dead Seekers (Jan. 2017). Learn more under Novels (and select “Mist-Torn”) at NobleDead.org.